Be the first to share your favorite memory, photo or story of Luciano. This memorial page is dedicated for family, friends and future generations to celebrate the life of their loved one. 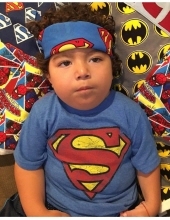 Luciano Badalamenti, age 3, of McConnellsburg, PA passed away on Saturday February 2, 2019 at the Milton S. Hershey Medical Center in Hershey, PA after a courageous battle. He was born on Friday August 28, 2015 in Waynesboro, PA, son of Vincenzo and Antonina (DiMaggio) Badalamenti of McConnellsburg, PA.
Luciano is survived by his parents Vincenzo and Antonina Badalamenti and one brother Vincent. He is preceded in death by his brother Santino Badalamenti who passed away in 2005. A Catholic Mass will be held on Saturday, February 9, 2018 at 10:30 A.M. at Resurrection Mausoleum Chapel 361 Sharrott Ave, Staten Island, NY with internment immediately following. In lieu of flowers, memorial contributions may be made to the Badalamenti Family to help other families and children suffering from the disease as Luciano. After the interment service a time fo fellowship and refreshment will be held at the Badalamenti House, 2056 76th Street, Brooklyn, NY 11214. The family has entrusted Luciano's care to Kelso-Cornelius Funeral Home in McConnellsburg, PA. Online condolences may be expressed at www.kelso-corneliusfuneralhome.com. To send flowers or a remembrance gift to the family of Luciano Badalamenti, please visit our Tribute Store. "Email Address" would like to share the life celebration of Luciano Badalamenti. Click on the "link" to go to share a favorite memory or leave a condolence message for the family.